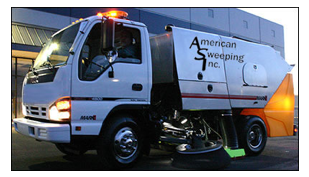 American Sweeping, Inc. provides service to a wide range of business, private and municipal clients. 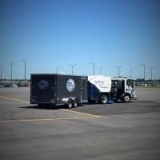 As an industry leader, and one of the largest sweeping contractors in the Midwest, we offer reliable and conscientious maintenance services performed by trained experts. Through the years, American Sweeping has built a solid network of satisfied customers. We guarantee your personal satisfaction. Our philosophy is simple: "You are the boss!! We're your partner, working in partnership with you to maintain your facility." American Sweeping provides multiple services for your exterior maintenance needs. 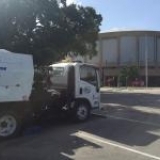 Our air sweeper fleet can't be beat for picking up trash, litter, leaves and loose debris, such as paper and plastic bottles from parking areas. We offer a variety of sweeping programs, from 7-day-a-week sweeping services to on-call cleanup of emergency spills and accidents. Meticulous detail work such as the hand-picking of trash and litter from islands, grassy areas and sidewalks often benefits from the personal touch of our day porter services. Our day porter personnel are also available to change trash bag liners, clean trash cans, and any other work that needs to be done on your property to keep it looking at its best throughout the day. Our mechanical broom sweeper fleet can remove rock, mulch, sand, broken glass and packed-down dirt from streets and construction sites. Our broom fleet can handle the toughest roadway and construction site sweeping tasks. Our high-pressure street flusher uses water to wash out curb lines and other large pavement surface areas quickly and efficiently. 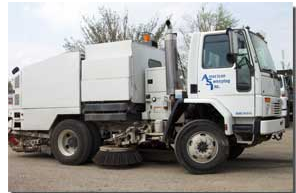 We can coordinate our street flushing equipment with our sweeping services. High-pressure hot water cleaning is often the best way to removing dirt, gum, grease and most stains. Our professional pressure washers utilize water up to 300 degrees have up to 3000 psi of pressure. If you have unsightly areas that might benefit from pressure washing,. This is a relatively inexpensive service that is highly effective. American Sweeping offers power scrubbers that are ideal for cleaning flat, interior concrete surfaces. The machine can clean up to 10,000 square feet per hour. Our sister company, American Waste, can provide dumpsters for your jobs as well. American Sweeping can be your one-stop shop for all your cleaning purposes. American has been in business for over 20 years because we know that our customers have high expectations and we are not finished until we have met those expectations every time. For more information on services and pricing call or email our office using the information shown below.